Planning on setting up a gym or other type of fitness facility? One of your primary considerations should be the flooring. Gym flooring should meet particular requirements and is one of the most critical surfaces in your facility. Before considering the type of gym flooring, you want to install, designate every area into a functional zone. Once you know what you will use each area for and the type of equipment that will stand in each zone, you will be able to choose your flooring accordingly. Gym equipment typically has a lifespan of up to seven years or less depending on usage and quality. If your flooring’s lifespan is shorter than that of your equipment, you will have to remove your equipment to replace your flooring, which can be disruptive and inconvenient. Fitness flooring is the most versatile type of gym flooring. The reason for this type of flooring is to protect the floor below from impact and to provide people with a comfortable workout experience. This type of flooring is not intended for intensive weights usage as the floor can incur damage over time. Fitness flooring should be around 6 to 10mm thick to absorb impact and be comfortable for those exercising. It should also be completely moisture resistant. If the flooring absorbs moisture, it can result in an unpleasant exercising environment or odours. Another requirement of fitness flooring is that it should have sufficient grip to allow for natural movement. Interlocking gym flooring offers a wide range of benefits, including easy installation, optimal floor protection, and a reasonable price tag, especially if you opt for a flooring option made from EVA. Because of these benefits, interlocking gym flooring is popular for use in home and commercial gyms alike. Since heavyweights that fall to the ground can cause considerable damage to a floor, it is essential to use dense flooring that is at least 20mm thick for free weights zones. Conventional flooring for free weight areas only protected the floor. Since this flooring type doesn’t offer any impact absorption, falling weights often break when they hit the floor. Nowadays, there are free weight flooring options available that offer sufficient impact absorption to protect the floor as well as the weights. Impact absorption is also a vital buying consideration as it reduces the noise of falling weights. If your gym is in a residential area, it may be worth opting for free weight flooring with a little more impact absorption. We also offer specialist flooring solutions, including temporary ice carpets, portable in-line hockey floors, plastic shower tiles, and synthetic floors for tennis and volleyball. 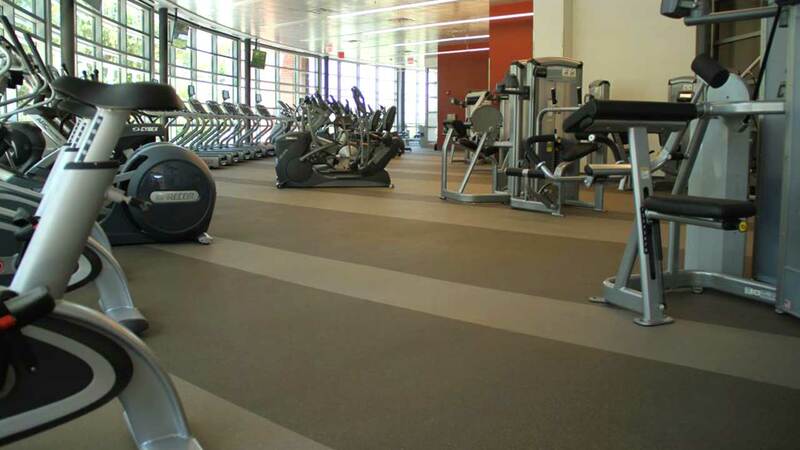 If you want to learn more about flooring for your fitness facility, contact Cascadia Sport Systems today.